So, the Bay Sports Tour is taking your fancy? Want to know more though? Is it beginner friendly? What size rider can be comfortable? All will be revealed below. A little background intro for Bay Sports first. They are a new company operating out of Sydney who put their heart and soul into the products they produce. Sourcing high-quality materials, glue and manufacturing processes, their iSUPs are beauty’s to behold. What you find below is the most informative review of Bay Sports 11’6” Tour we can muster up. We would even say, the most informative on the internet. We keep it real, we keep it honest and try to entertain while educating. As a touring board, this SUP is tour-iffic. It’s got the speed, the wide stable base which is also comfortable and tracks amazingly. I went for an ocean paddle out the back past the waves, where it wasn’t wobbly and felt solid, even my friend who is a complete beginner announced he felt okay. The nose is pointed so you pick up speed and keep that speed consistent cutting through the water, however, the tail is squared off so that you maintain a sense of stability. This makes it the perfect blend of speed and stability, which is ultimately what you want in a touring board. While it’s possible to catch a wave, the turning abilities aren’t as sharp as say, their 10’6” Explore. I tried to catch a few in and found it difficult. Definitely better suited to the flat water conditions. When it was out on the flatwater, I found picking up speed a little slower than the 10’6” but it tracked better than the 10’6,” and because of that, I found my speed kept more consistent on the Tour. I also did some SUP yoga on the Tour. It was a little wobbly up front but that’s to be expected with the shape of the board. Also perhaps because SUP yoga is simply wobbly. I did find the 10’6” more stable for SUP yoga. I think because of the shape being slightly more equal throughout. 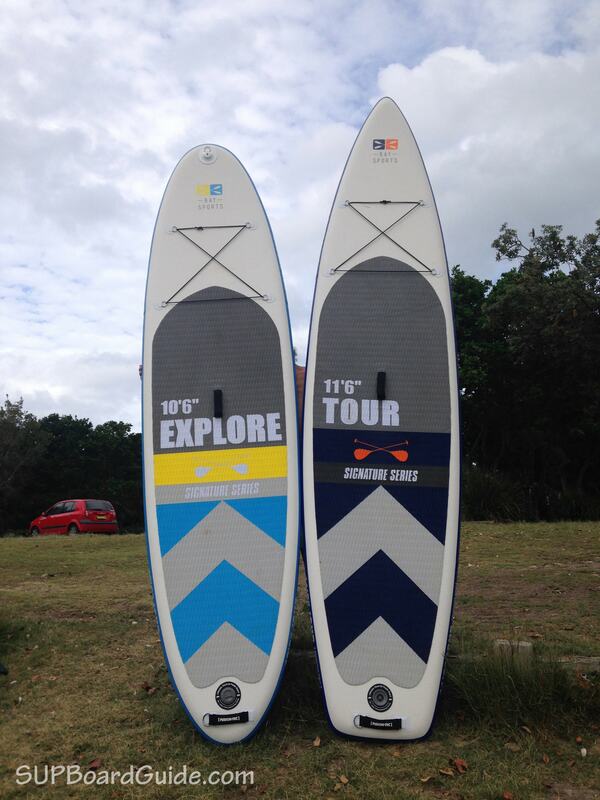 An improvement I’d like to see is the chance to use the SUP as a single fin. 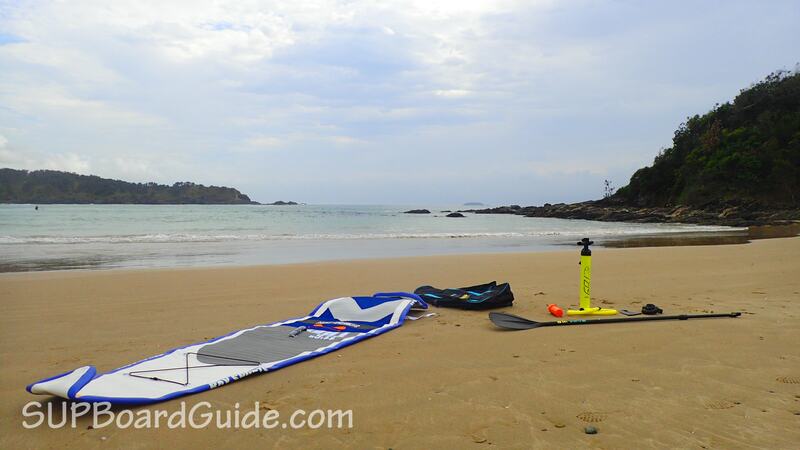 It’s perfect for beginners to have 3 fins for the extra stability. 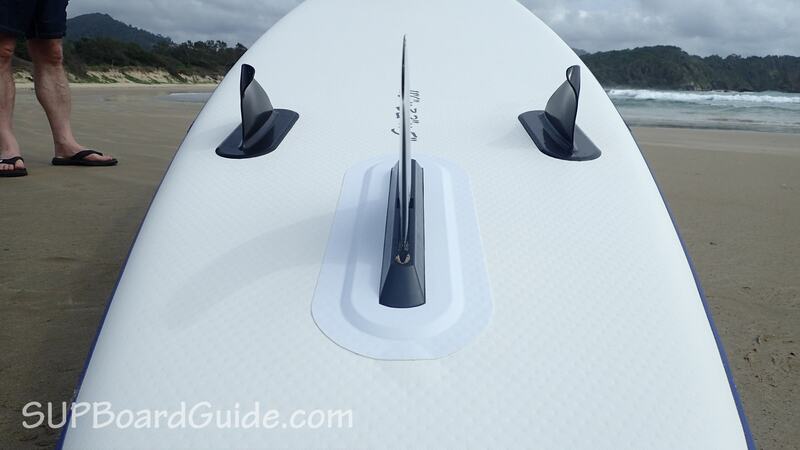 Once you are comfortable though, a single fin setup makes for extra speed and can improve the tracking. You’ll be recommended to inflate at 15 PSI but this 11’6” definitely can go the few extra PSI. Inflation to around the 17/18 mark was way more stable and reduce any chance of flex. Especially as it’s 5” thick, which is a little less than most standard iSUP’s, a bigger rider or long use, you may feel that flex without inflating it a little more. Let’s break this down into layers. Starting at the beginning of time, the core of the Tour was born. It’s made up of layers stitched together using a technique called “drop stitching”. Drop stitching refers to threads being woven between the layers. When these threads are stretched; so as you inflate, they tighten and become stronger. Then around this layer is fused the second layer. This is different to the standard hand gluing of layers. Using Fusion-Tech not only eradicates human error while gluing, it sheds kilos off the weight of your SUP. Why? The fusing is so watertight and strong, that extra layers aren’t needed like on other SUP’s. 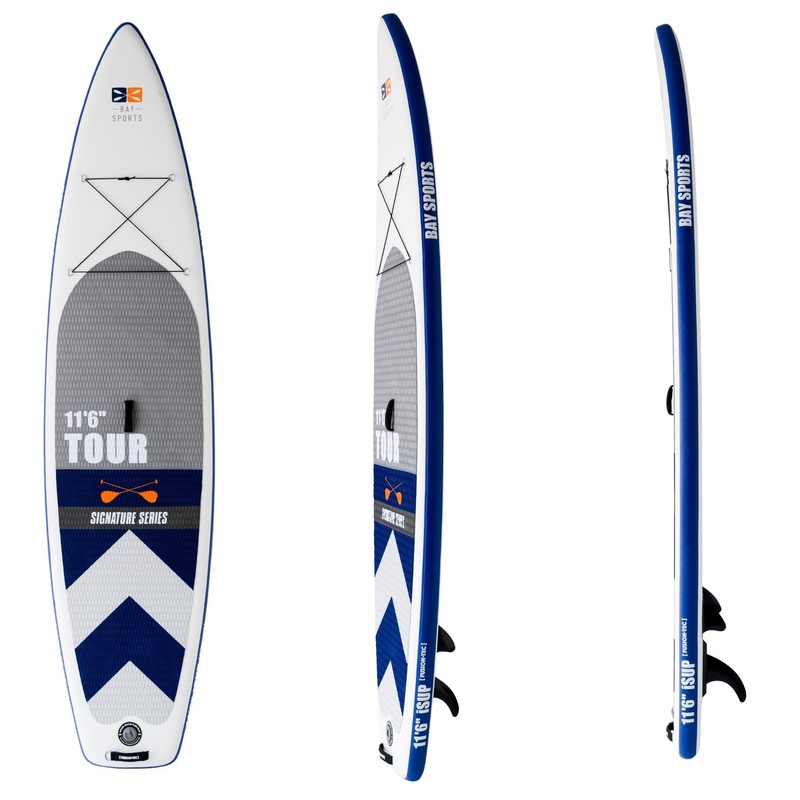 So what you get is this SUPER light SUP at only 19.6 lbs (8.9kgs). Bay Sports, however, has reinforced their rails (the sides) three times over. Due to the rails being the most commonly damaged area, it makes sense. Combine all of these and you get an indestructible solid SUP, that’s light and easy to transport. It’s rigid enough for multiple passengers, with a max capacity of 375 lbs (170 kgs). I went out for a paddle with a friend and our combined weight is 264 lbs (120 kg). Hardly noticed a dip anywhere. On top to keep you stable and comfortable is their signature EVA deck pad. It’s so comfortable that I have more than once already thought about doubling my Tour SUP as a camp mattress to save on space. 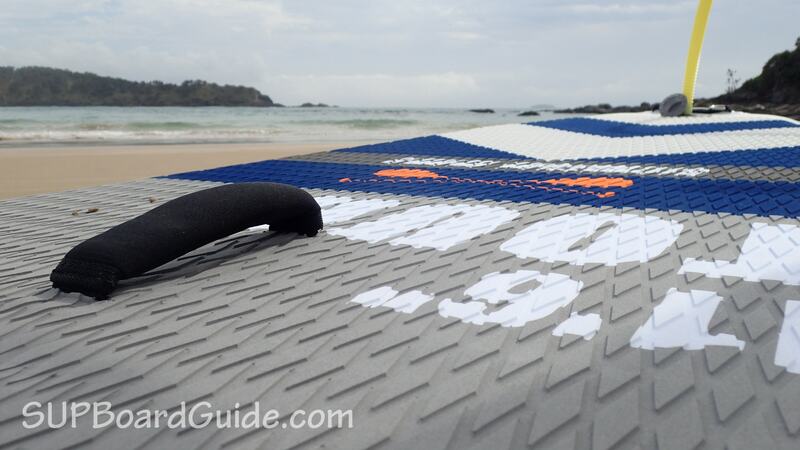 I used it for SUP yoga, and it definitely helped with the grip. 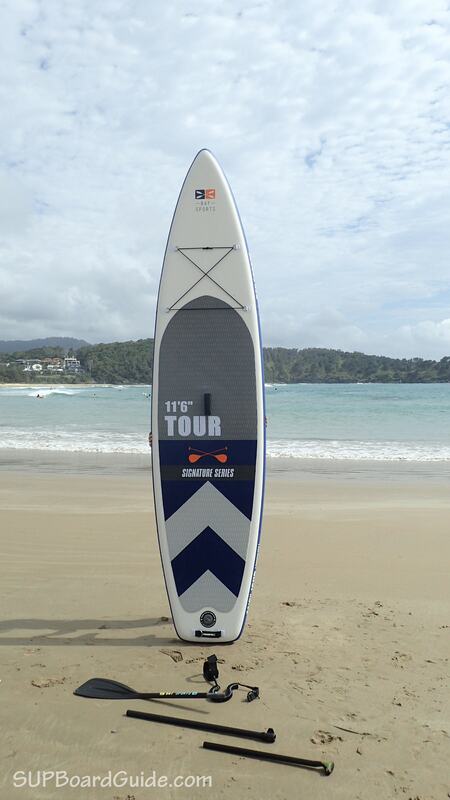 Shiny and prominent logos printed down the sides are coated with UV oil to keep your SUP looking sharp and new. Even though it’s an aesthetic thing, it will help if you ever need to resell. 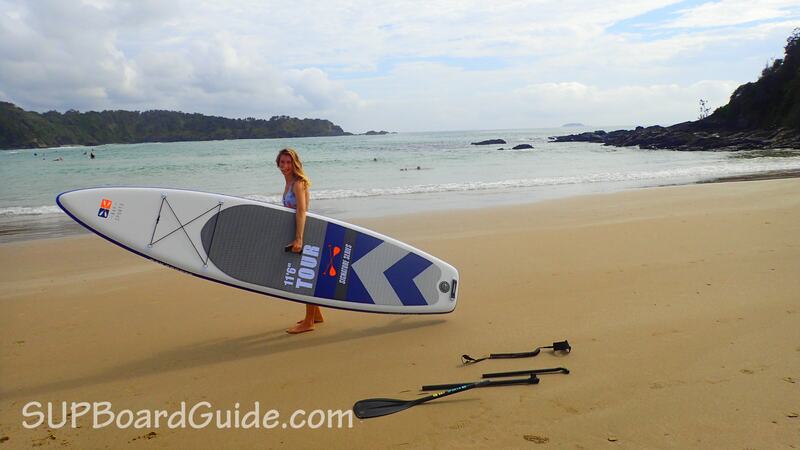 Being a touring SUP, it’s suggested you’ll be out for more than a 5-minute paddle. In that case, you should be bringing water and snack! Having the D-rings up front with bungee cord makes that entirely possible. You’ll be able to safely secure your gear, even if you were to have a tip! Just make sure it’s in a dry bag! Flipping the board over, you’ll notice two fixed screws and a removable center fin. The side fins are made of molded plastic. Don’t be concerned when you unload your SUP and the fins are a little bent out of shape. Five minutes in the sun and a wiggle, and they’ll be back to shape in no time. These are great additions for flex in storage but also shallow water. I received a screw-in center fin at the time of receiving these SUPs. As you can see in the photos. However, I was informed shortly after, that all Tour boards here on out will have the FCS Connect II 9” Touring fin system. Means no more screw and plate! Huge improvement for a small change in my eyes. Securing the fins is the US Air 7 Fin box system. It’s compatible with a screw in and also the Connect II. Toolless and limited parts to lose is my preference! Inflation is simple with the high pressure, dual action pump. Or your electric if you’re lucky enough! I mentioned earlier that it’s recommended to inflate to 15 PSI but with the 11’6” and anything above, inflate it to 17/18. It can hold up to 26 PSI so you won’t be doing any damage. Note: Switch to single action at the last few PSI, it helps decrease resistance dramatically! Deflate, push the pin in and twist. Air will go out, you will roll the SUP up, and within 5 minutes you’ll be ready to get home and have a rinse! With three color choices, you can find a board to suit any personality. Get loud and proud with the Orange and Grey – not the usual colors you’d see! Or keep it cool, calm and collected with the two versions of blues. Having a board that stands out is a superficial reason to buy one, but, it’s something we all love anyway! There is also definitely a sense of safety too. Standing out in crowded areas, such as marinas, is a good thing! 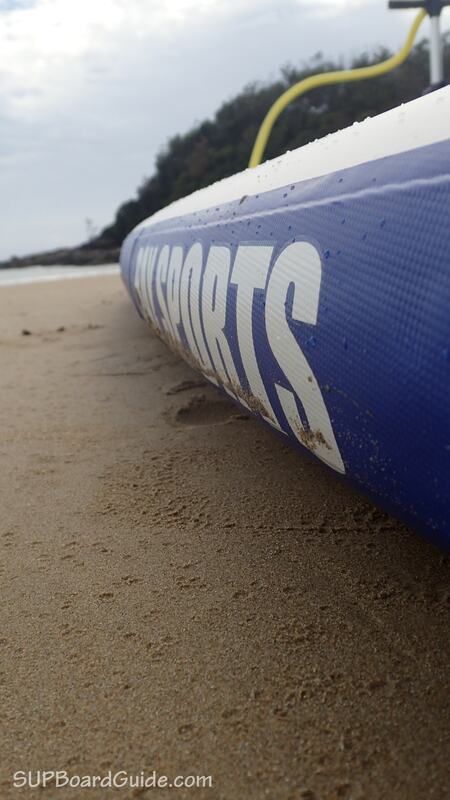 We don’t want to hear about any of our SUP family being nudged off their SUP by a clumsy fisherman. You can find handles located in the centre and tail of the board. I can’t believe how often I use the handle at the tail on SUP’s. Without it, I wouldn’t say it’s useful but now I have experienced a tail handle – I think I’m hooked. One more on the nose would be a dream…hint hint. Both handles are covered in soft material to protect hands. Another small but worthwhile feature. The bag is 10/10 which I go more into below in accessories. So, with saying that, portability is again 10/10 once rolled up in its cocoon. You receive the full kit and caboodle with Bay Sports. Which I like! Not only is it the full kit, but it’s also a good quality one. Like the fiberglass paddle, you’ll get. It’s fully adjustable from 2.2 m to 2.3 m and with easy to read heights. That way you can just remember your height and not need to measure every time. Many paddles included are heavy and not put together well. They are there for necessity and not pleasure. 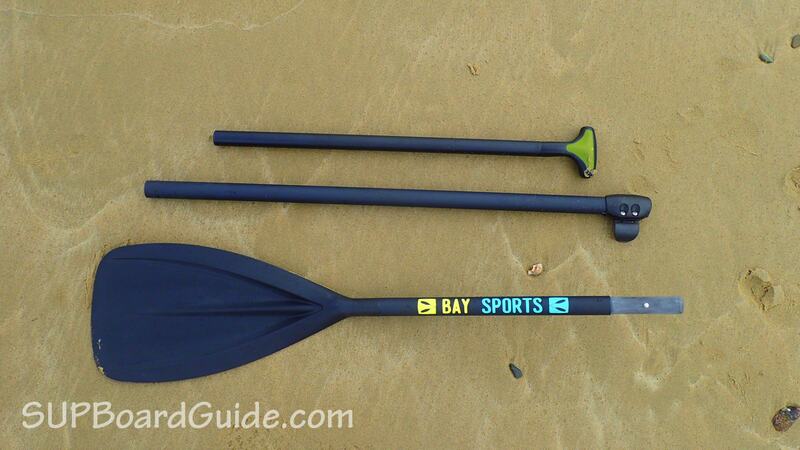 This isn’t the case with the Bay Sports paddle. Straight away I noticed the smooth feeling of the matte finish and lightweight (940 g) nature. The lock is a clasp handle which is easier to use than the pin lock system, but it means you need to make sure you’re putting your handle in straight. The clasp felt smooth to use, which tells me it’s been made well and not cheap plastic that will snap. On your handle is a rubber grip for comfort but also to keep any blisters at bay hopefully! The grip is also designed with some ergonomic grooves for correct handling. Bay Sports takes your safety seriously. They include a coiled leg rope to keep you attached to your board. Coiled because being attached can also be dangerous. If you have lots of leniency in the stretch of your leg rope, like you do with coiled leashes, it’s safer. Now the other safety feature is the key stash. Safety of not being yelled at by significant others when you’re standing, shivering, but can’t get in the car because you’ve lost the keys to the ocean. I may or may not be talking from personal experience. Are you an adventurer? So, do you like to make the most of owning an inflatable? By that, I mean, getting into remote places. Because, you know, a big hardboard isn’t fun to carry. Having a backpack that is supportive throughout the shoulders, waist, and back is essential. Well, for using it more than a 5m walk between car and water anyway. Which is why I applaud the Bay Sports backpack. It has full support throughout the whole bag. The extra cushioning not only supports but makes carrying a whole lot more comfortable. 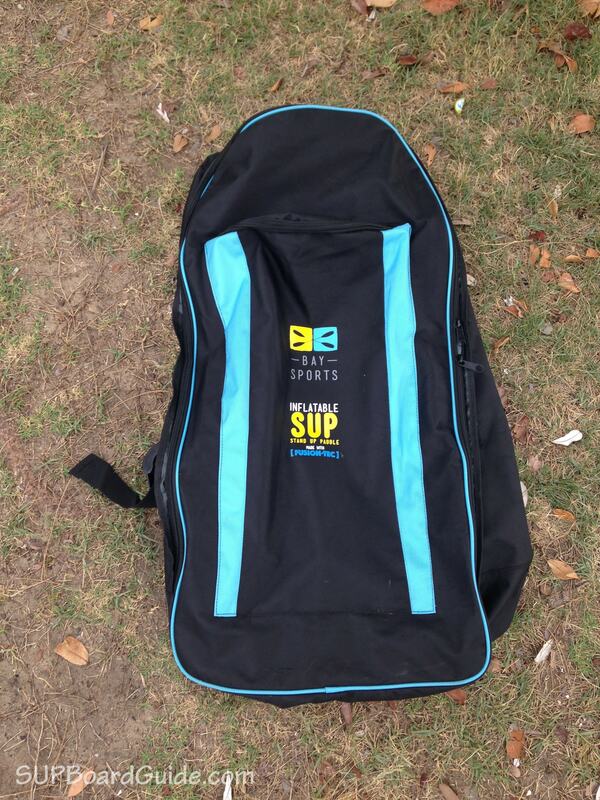 I notice a big difference in their bags to other SUP’s bags in the same price range. There’s also handy extras like the handles. That was an unintentional pun, but it’s staying. As I was saying, the handles on the top and side of the bag make moving the bags around not so awkward. Mesh sides ensure breathability and no stinky wet SUP stank. It’s recommended that if you store them for long periods, you make sure they are entirely dry. Otherwise, you may have a stinky and moldy SUP! What may look like little floaties for you are actually fin protectors. I mean, by all means, wear them if you want, but you may get a sideways glance. There are PFD belts which don’t get in the way if you are after some more safety. 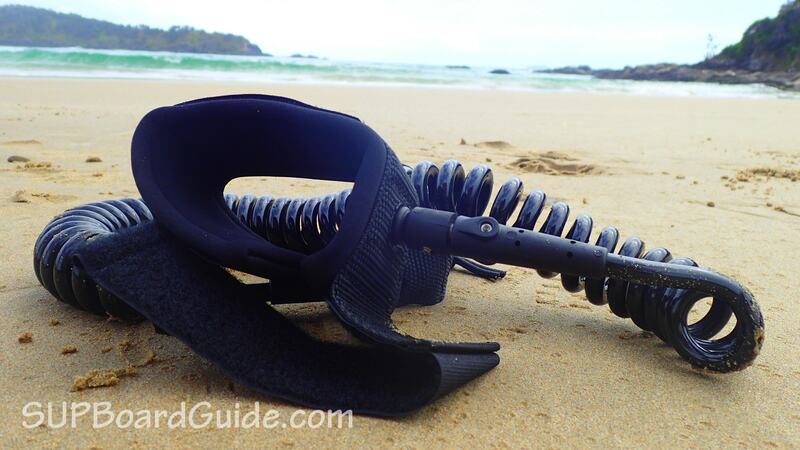 The fin protectors slide down and around your fins. They act as protection from extra flex when storing your board. Worthy addition as if you have been reading all the way through, earlier you would have noted the side fins are made of moldable plastic. Inside your repair kit, you can expect to find glue, some patches, and a valve tool. Particularly useful to be able to do minor repairs yourself. Saves you from being SUP-less for longer than needed! 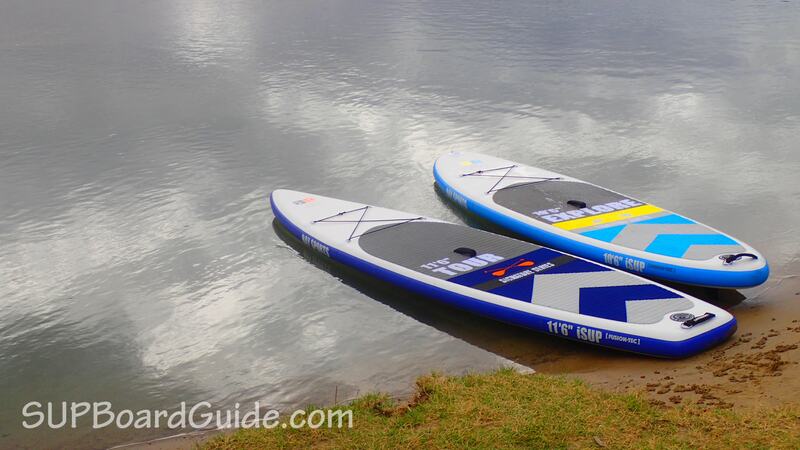 If you are intending on purchasing a SUP for flatwater use, especially for extended hours of paddling, you can’t go wrong here. 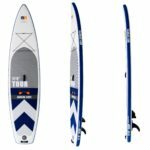 This one, and the Thurso Expedition are two of the best inflatable touring boards of the season. You’ve got the stability and speed that are balanced perfectly. Then you also have the comfort and necessity of storage area with bungee cords. Your paddle is worth keeping and using for long distances, and you can get in and out of remote areas with ease. Beginners will love the Tour for the stability the wide tail brings but if you are still finding it wobbly, the 10’6” Explore may be more suited. It’s smaller and the slower, but the shape is better rounded for stability. The extremely lightweight nature should be highly valued too as it makes these SUP’s so diverse that a whole family can use them easily. Once you get going on the Tour, you’ll be flying, with the wind in your hair and your worries left at the shore. You also can not beat the customer service Bay Sports gives. Have you ever heard of a company that calls up their customers after purchase to make sure everything is okay? With a two year Warranty and 30-day free-return policy, you know they mean business. They stand behind their products and so they should! They are awesome!